EXHAUST GAS SCRUBBERS FOR MARPOL COMPLIANCE. The design of the marine exhaust gas scrubber combines the most effective designs developed by CROE over the past 60 years and our understanding of the many needs and requirements of the shipping/marine industry including the need for small footprints and ease of retrofit into existing structures; the need for high reliability and high uncompromised efficiency; the need for reduce weight at the higher elevations to minimize impact to stability calculations; the need to reduce water circulation and the associated pump electrical usage; the need to be able to allow the exhaust gas through the scrubber without the complications of having to add a bypass and without concern to the integrity of the scrubber; the need to have available different configurations to more properly address any specific routing. Bottom entry design to allow a direct upflow configuration and simplification of the engine exhaust gas duct. This minimizes the required footprint and allows it to more easily fit into the existing structure with less modifications. Strategically configured exhaust gas inlet and scrubber drainage to minimize any potential of water backflow to the engine. Eliminated circulation water storage from bottom of scrubber vessel to a separate tank at a lower elevation to reduce weight at the higher elevations and improve stability. This configuration also works in concert with the inlet and drainage configuration to reduce potential of water backflow to engine. All metallic construction (external and internal) to extend the life of the system and to allow the exhaust gas to travel through the scrubber system in “dry conditions” and “without a bypass” during areas of the world where scrubbing is not yet needed. The no-bypass capability reduces the amount of space required around the scrubber for the complex system of bypass ducting, valves and controls. All this reduces the size of the area required for the scrubber leading to an easier fit on board and to lower installed costs. Additionally, it also increases the on-line reliability of the complete system. Used proprietary packing designed specifically to increase contact area with lower liquid flows to save on the typical pumping costs associated with some scrubber designs. The proprietary packing is also designed as part of the overall sound attenuation of the system in both the wet and the dry modes. The CR marine exhaust gas scrubber is available in Open Loop Design, Closed Loop Design or Hybrid Design to provide maximum flexibility in the decision making process. Let us help you decide what is best for you. All provided at a very competitive price to help with the decision to install the CR scrubber on your vessel. 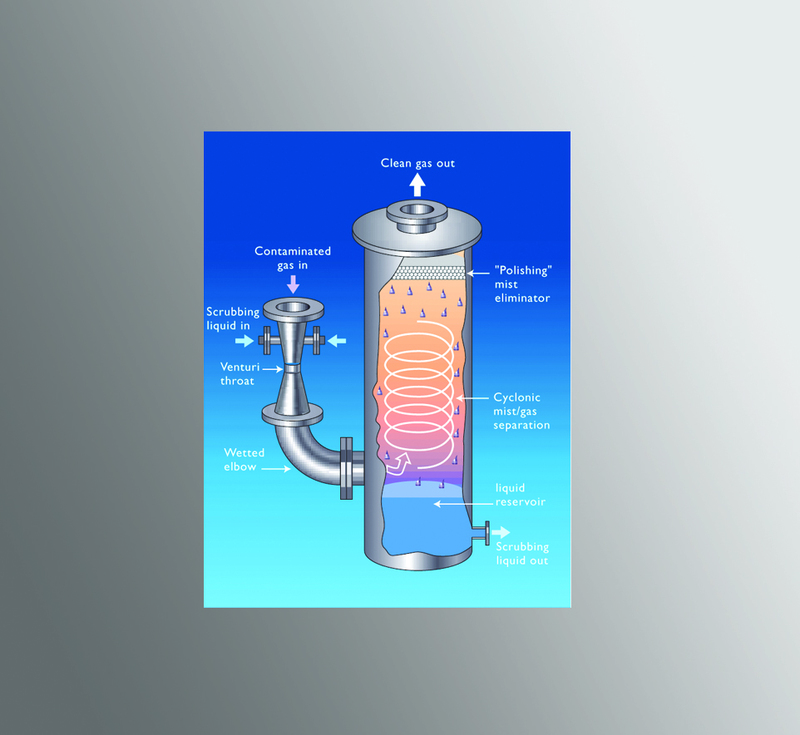 CR Marine Exhaust Gas Scrubber:The use of our vast experience with packed tower designs allowed CR Ocean Engineering to design a packed-tower-based marine system that brings together the more than 60 years of CR technology development to this new scrubbing industry. Packed Tower Wet Scrubbers are ideal for ultra-high removal efficiencies required by Annex VI of MARPOL. CR strength lies in its engineering expertise and, although the principles underlying this design are well established, efficiencies of 99.99+% can only be achieved by proper selection of packing type, size, packing bed height and liquid to gas recycle rate. CR’s chemical engineers have the depth of knowledge to tailor marine exhaust gas scrubbers to the exacting requirements of each installation. The CR marine exhaust gas scrubber is also available with a HIGH ENERGY VENTURI inlet for higher particulate reduction. CR OCEAN ENGINEERING’s High Energy Venturi inlet is ideally suited to the capture of small particles between 0.5 and 3 microns. The success of an installation will depend on the engineering expertise involved in the units design. CR engineers have a level of expertise and a depth of experience unmatched in the industry. The CR exhaust gas scrubbers are available in a variety of diameters, heights and materials of construction and therefore are well suited to the inherent limitations involved in onboard installation. CR’s engineering teams is well versed in the intricacies of scrubber design and is uniquely prepared to address the atypical design requirements of the marine industry.